Globe goes mobile messaging app bundle with this latest promo offering to all their subscribers. 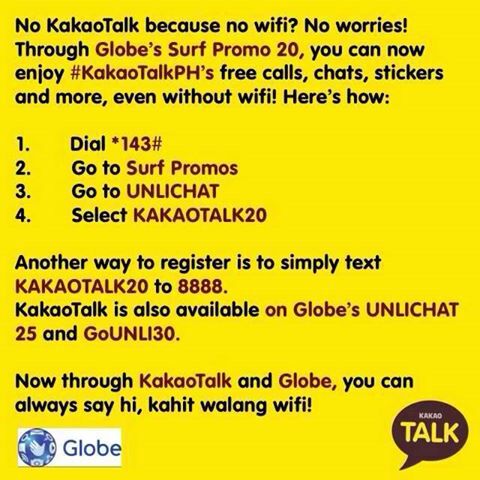 If you’re using KakaoTalk to connect and chat with your friends you can avail KAKAOTALK20 from Globe GoSAKTO Surf promos. No need for you to connect to a Wi-Fi hotspot just to use this messaging app, all you need to do is load up your SIM with 20 pesos to register then you can now enjoy unli chat, calls, emoticons or stickers and more. 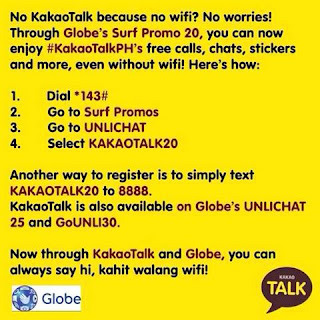 You can register by dialing *143# or by texting KAKAOTALK20 to 8888. On your phone, dial *143# and press Call. Go to UNLICHAT to see available chat promos. Choose KAKAOTALK20, type 1 to subscribe to this promo. Wait for the confirmation message that you are already registered to the promo. Once received, you can now enjoy KakaoTalk app services with Globe. KakaoTalk is a bundled on other chat promo like Globe UNLICHAT 25 that gives you unli access to your favorite IM app like Viber, WeChat, Line and more. Also available on GOUNLI30 promo that comes with unlimited calls and all net texts plus unli usage of selected mobile messaging application. pwede din ba yan sa TM users?